It might be prudent if Peterborough United’s priority for the next few weeks is to secure their survival in League One for another season. Stop all the talk about 18-month promotion promises, play-off surges and entertaining, goal-laden football. Such blind optimism just makes failure even harder to bear. Twelfth-placed Posh have won 13 and lost 13 League One games this season which rather proves their averageness in a division badly lacking in quality and class. Posh have delivered some outstanding displays (Oldham, Crewe, Scunthorpe), but there have been an equal number of miserable efforts and yesterday’s (February 20) 3-0 defeat at Millwall was right up there, or rather down there, with the worst of them. The so-called ‘entertainers’ have lost their attacking mojo. They are David Gower without his cover drive, Rory McIlroy without his power hitting - what made them great to watch has disappeared. Posh have scored twice in their last six League One matches at a time when the back four has become riddled with more holes than David Cameron’s credibility. It’s a combination which, unless cured quickly, will lead to a visit, possibly permanently, to the bottom half of the table. When your best attempt at goal is a 45-yard back-pass from an opposing central defender, Lee Beevers, which ‘keeper Jordan Archer brilliantly headed over the bar in the 15th minute, it’s time to address some pretty serious issues. This was a huge game in terms of play-off-prospects. Win and Posh would have been within three points of the top six, but instead a second crushing loss in succession has left them eight points adrift. Of course six points from two home games in a row against mediocre opposition would paint a much prettier picture, but who can truly be confident that a resurgent Oldham and a Nicky Ajose-inspired Swindon will be put to the sword? Especially as Chris Forrester, the one Posh shining light on a dull day in South London, may well be missing through injury and Michael Bostwick will be suspended after picking up one of the most stupid cautions possible in the final seconds of a game that was already lost. It’s probable that many Posh fans will join Bostwick in missing the Oldham game when a rare sub 4K league gate could well be on the cards. Posh midfielder Martin Samuelsen battles with Joe Martin of Millwall. Photo: Joe Dent/theposh.com. Posh are doing little to entice extra fans through the turnstiles with their performances and results. 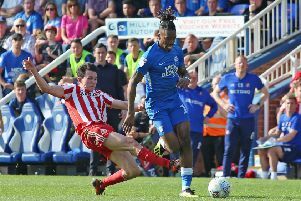 FA Cup matches aside and Posh haven’t played consistently well for almost three months and, as manager Graham Westley remarked in a grumpy post-match press conference, it’s easy for players to motivate themselves for the best knockout competition in the world. As ever Westley’s words were interesting. He questioned the ambition and desire of some players and also appeared to query the club policy of sourcing young players from lower leagues. ‘Maybe they’ve reached the height of their ambition right now by playing in League One,” Westley stated. Westley said he wants Championship players in his squad and yet left two with the potential to do that, Marcus Maddison and Jack Baldwin, on the substitutes’ bench. He also revealed Erhun Oztumer and Bostwick had been ill in the night and yet started them, while capable players, notably Maddison and Baldwin again, were sitting in the dug-out. Young players, even those happy with third tier football, require sound management. The last two weekends have been more Van Gaal than Guardiola with strange selections followed by surprise substitutions - Jordan Nicholson was handed a Posh debut (before Maddison was sent on) as a half-time substitute at the New Den, a modern day example of being thrown to the Lions. Millwall have a poor home record for a team in the top six, but sauntered to a 3-0 victory. Their manager Neil Harris said his players just ‘went back to doing what they do best’ which presumably meant running hard at a cumbersome centre-back pairing, physically over-powering opponents in midfield areas (Jimmy Abdou was a beast), exposing the lack of defensive cover out wide and winning every meaningful header, tackle and second ball. Millwall scored with three headers. Two from Steve Morison and one from Lee Gregory. Two arrived from set-pieces where the Posh marking was often woeful. Gregory should have also scored from Millwall’s first corner in the 21st minute, but hooked over the bar from six yards. Gregory played a big part in the opening goal on the half hour though as he picked up a Jed Wallace pass and forced a fine save from Posh ‘keeper Ben Alnwick. Gregory’s composure and vision were excellent though as he promptly chipped the ball across goal for Morison to head home from close range. Gregory headed number two early in the second-half after a free-kick had been nodded into his path and the points were wrapped up when Morison met a corner unchallenged seven yards from goal with the inevitable consequences just past the hour mark. The third goal prompted much player dissent as Posh skipper Alnwick aired his opinions to team-mates. Sadly it didn’t prompt any fight as Posh limped their way through the rest of the 90 minutes without posing much of a threat. Maddison forced a fine save from Archer from distance, while Nicholson sent a decent shot goalwards before Posh were put of their misery. Westley made six changes to his starting line-up for this game and it would probably have been seven if Lee Angol hadn’t ruled himself out through injury in the norning, but the forward’s stand-in was neither of two recent forward signings who sat on the substitutes’ bench, but on-loan 18 year-old midfielder Martin Samuelsen, who predictably struggled. Only sole striker Souleymane Coulibaly won admiration from his manager and that was for his attitude more than any obvious quality in possession. As usual Forrester won the fans’ praise before he was knocked out of the contest in the dying stages by a thunderous challenge by Millwall right-back Mahlon Romeo. Moments later Bostwick, one of those who could fill in for Forrester, collected his 10th caution of the campaign with a dozy challenge that rather typified a disappointingly thoughtless Posh approach. Posh: Ben Alnwick, Michael Smith, Harry Toffolo (sub Jordan Nicholson, 46 mins), Ricardo Santos, Michael Bostwick, Chris Forrester, Harry Beautyman (sub Marcus Maddison, 58 mins), Jon Taylor, Erhun Oztumer (sub Shaquile Coulthirst, 46 mins), Martin Samuelsen, Souleymane Coulibaly.Unused substitutes: Dion-Curtis Henry, Gaby Zakuani, Jack Baldwin, Tom Nichols. Goals: Millwall - Morison (30 mins & 62 mins), Gregory (50 mins). Cautions: Posh - Coulthirst (foul), Beautyman (delaying the re-start). Alan Swann is at the game for the Peterborough Telegraph so follow all the team news, LIVE commentary, match report and match reaction here.